Head over to get one (or a couple...) of these Personalized Plush Bunnies for ONLY$ 18.99 (Retail $26.99)! 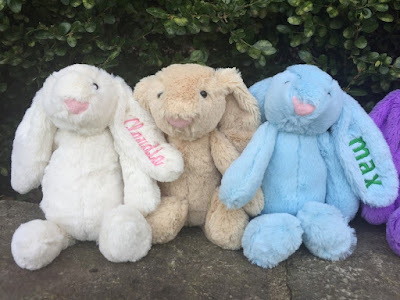 Spruce up your Easter baskets with my cute plush bunnies! The 10 inch bunny is machine embroidered in the color and font of your choice.